CCMT 2017 Counselling Procedure– Students that participate for the Centralized Counselling for M.Tech / M.Plan Admission are are now can apply for Counselling through Gate Score(Counselling is only for Gate qualified candidates). Here You can check all the details about CCMT 2017 counselling & CCMT College predictor by www.inspirenignite.com. Sometimes students secure good rank in GATE exam, but they got lower college in counselling because they don’t participate actively in counselling. If you are one of them or you don’t want to make this mistake again or you are fresher in Counselling then you are at right place. A lot of students are not aware of GATE counselling mistakes because they are newbies in this field and they don’t have enough knowledge for about GATE counselling process. Q. One of my friends got better college then me, I secure more marks in GATE rather than my friend in the same category & same branch. How I complete this process that I will get better NIT or IIT? I assure that if you follow all the steps then you surely get Best collage according to your interest. So now we start the process in following steps that are easily described for every Gate Qualifier. Please read the instruction carefully that are mentioned on Information Brochure. Candidate can change, delete and re-order their choices until the choice filling locked or submitted. Choices are locked till the last date, according to CCMT counselling information brochure and you can also add colleges before the choices are locked. Candidate should fill the branches from above infographic suggestions and also prefer the more popular branches first because popular branches have scope better than other branches. One more thing that you keep in your mind that is please do not fill any for NIT or IIT. Suppose you get IIT but the branch is Physics and then you don’t satisfy with any IIT with lower valuable branches so open your eyes when to fill the colleges and branches in CCMT 2017 Counselling to get better college and batter branch. Visit the social sites(like- Facebook, Google+) for an estimate of branch or college according to your Gate score also check college predictor and branch predictor on different websites for an estimate. Don’t fill all the branches and also that are not according to your interest .ex- if you interested in Electrical related branches( like- Power Electronics. Power System, Signal Processing and Control, High Voltage Engineering, Integrated power system or Digital Electronics etc.) and CCMT allotted Computer related branches( Computer Science and Computer Technology, Information Technology, Software Engineering, Information Security and Database and information etc. ) then you do not do your best so choose it carefully. Find the forum on the internet submit your rank and score to get an additional estimate from previous year students or from experts. NIT M.Tech admission 2017 through Gate has also performed under CCMT 2017 counselling because CCMT is conducted by NITs for a single counselling by for all institutes. Gate Qualifiers also put one thing in your mind that this is not a straightforward to get the best college without active in counselling if you spend Rs 40000 in spot round then you have better chance to get NIT through Gate. The Last and final CCMT Registration tips are candidates have to go to the allotted Institute with the original documents, DVN signed by RC officials for final admission and attending classes as per the academic calendar of the Institute. When all the process completed then CCMT official send Registration Number and password on your mobile no. or email. Log in using your registration and password then fill the colleges and branches according to your interest or for batter opportunity. Fee Submitting Process is Completely Online. Spot Round will charge Rs. 40000, if you get any college then the money in not refunded. (it included in your session fee). Candidate must print the choice filling form after the counselling or take a screenshot for future reference. Open official website of CCMT. Select the link for CCMT 1st Round Allotment Main 2017. Enter your Registration no. and Password. Now download the 1st Round Result. one of the reporting centers. If you aren’t allotted a seat then apply for 2nd Round of CCMT Counselling. Candidate Should verify our document at the Reporting Centres (RC) because those do not report at the college canceled automatically without any notice. When the document verification is completed, college or RC issues a Verification note signed by Reporting Centres officials. 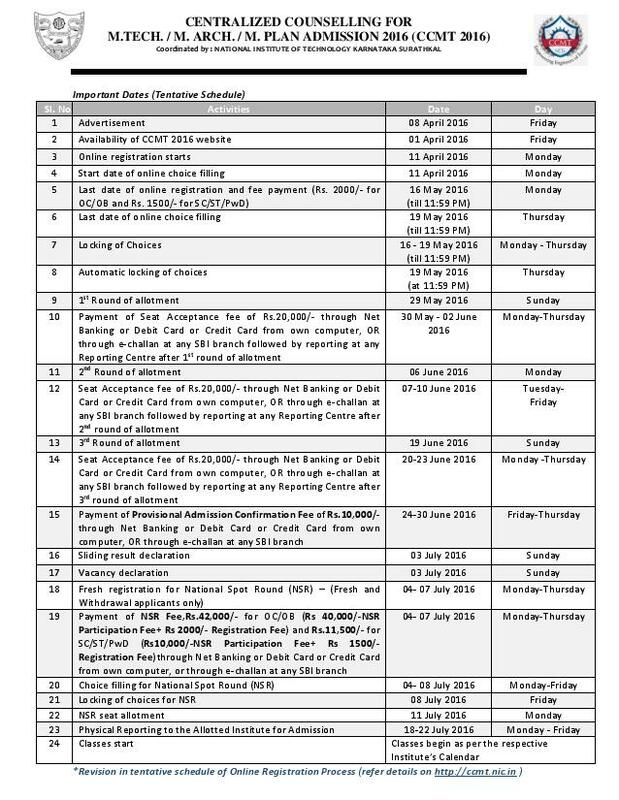 Candidates can also check 2nd counselling allotment result using step 1,2,3,4 that are described in 1st Round allotment process using the repeated steps. TYPE 1: Those candidates who do not get any college or branch in Round 1 of CCMT counselling 2017. Type 1 should apply for 3rd Round in counselling. TYPE 2: Those candidates who get college in the first round but apply for the second round. Type 2 candidates pay the fee at nit reporting centers and apply for 3rd Round nit admission through Gate. 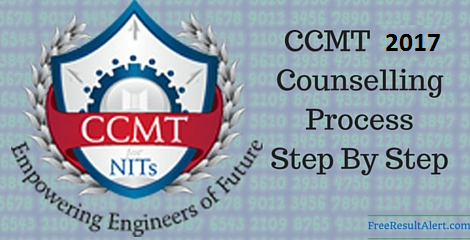 Follow the first 4 steps of the 1st round of counselling of ccmt. The seats are vacant in the 2nd round are allotted in the 3rd round. TYPE 1: Those candidates who do not get any college or branch in Round 2 of CCMT counselling 2017. Type 1 should apply for Spot Round in counselling knew as CCMT national spot round(NSR). TYPE 2: Those candidates who get college in the second round but apply for third round NIT gate counselling. Type 2 candidates pay the fee at nit reporting centers and apply for Spot Round of nit admission through Gate. Check the Spot Round result and report on Reporting centers for submitting fee Rs. 40000 and Rs. 10000(for SC/ST) using NIFT or Net banking / Credit Card / Debit Card. Candidates may directly proceed to the respective allotted Institute with the original documents, DVN signed by the RC officials and the provisional admission letter downloaded from CCMT website for taking the final admission and attending the classes. Candidate fills the choices before the last date otherwise there is no option for the candidate to get admission in NIT using Gate Scorecard. Students can our college list after the result of Spot Round in CCMT counselling. After the payment of the fee, the student can download joining latter of specific college that are provided you in last round of CCMT counselling 2016. Candidates if you want to receive any updates Related to CCMT Counselling 2017 or NIT Gate Counselling. You can join us on facebook or Google Plus. if you have any Query about CCMT Counselling then ask in the comment. We will update review for all the slots here. Press CTRL+D to bookmark this page for easy navigation. I got gate 2019 ECE score 346 marks 14959 rank. Is there any chances of getting NIT? It will be adjusted in semester fee.. Please suggest NIT for me.MY gate rank is 14281 and marks 26.34 and score is 367 and OBC category. I got gate 2019 score 346 marks 27.3 rank 14959. Do I get any nit?? Hello sir I am 4th year student and complete my graduate in June 2017..can I eligible for this as I score 698 marks in ce gate 2017?? I’m from mechanical branch and given gate 2017 as a OBC candidates. After getting answer keys from various institutes I’m getting approx 45.33 marks. I want to do m.tech?? 1. Jadavpur University- Manufacturing, Design, Thermal, materials technology. 2. IIEST- Manufacturing, Design, Thermal, materials technology. 3. NITs- Manufacturing, Design, Thermal, materials technology. can i get any one of the above??? Are JU, IIEST and any NIT give stipend while doing m.tech?? Help me sir!!!! Very much confused!!! And one more thing I’m obc category issued by state government under NCL which is not included in central list of OBC. Can apply as OBC candidates??? sir i didnot get to take printout of my locked choices in NSR round.without the printout cant i seek admission?please reply me as my councelling is too near! Further procedure after getting seat in ccmt nsr round? which nits are better for me ? Any chances of getting NIT nagpur in spot round.should i apply for NIT nagpur or not..please reply soon, tommorow is last date..
Hi, i think that i noticed you visited my website so i came to ¡°go back the prefer¡±.I’m attempting to to find things to enhance my site!I suppose its adequate to use some of your ideas!! Sir I’m a electrical student with a gate score of 388 and rank 13344 under gen category. Is there any chances of getting nits. if yes kindly tell me the preferences. i have paid my seat acceptance fees and institute allotment fees both. but now i dont want to take admission . is there any procedure by which i can refund my paid amount. if i will not present at the institute for remaining fees during given period what happened next? My gate score is 419 in electrical engineering.I was registered for CCMT-2016.Now if I want to appear in spot counselling,will I have to pay registration fee Rs2000 again??? how is VIT vellore college for IT stream? Is pursuing mtech in this college with the mentioned branch fruitful ? sir my gate score is 393 ECE in OBC catagory which nit i can get in nsr in VLSI or communication technology? My gate 2016 score is 438 , 32.83 marks Electrical eng. and i belong to SC cat. sir, my gate score is 400 . i m from electrical branch.i did not get any branch in mnit jaipur till 3round.is there is any chance to get admission in national spot round. I got NIT surat(ENVIRONMENT ENGINEERING) in 2nd round and i applied for floating. do i need to visit the RC(reporting centre) again? sir what are the chances of getting seat in NSR round for St student. sir if i reject the seat in NSR after is alloted… then will i get my 40000 rs paid amount.? which are the best nits for civil … my score is 511 and rank is 4518…pls help with this? I Belong to obc category. I got nit Srinagar in 3rd round. Now what should I do to participate in spot round. Are there any chances to get nit? My rank is 3570 gate score 573. EE general category. What are the possible nits and branches will i get in the spot round?? sir I got 42.31 marks and 572 gate score in ec in gen. category. I didn’t get any college in ccmt due to not filling options proprly. what are my chances for spot round and if I get a college in spot round, what about 42k, Will that be paid as college fees or is that just spot round fees and I have to pay college fees separately? sir, my score in EE this year in gate is 573 in general catagory. i got power system in nit hamirpur in 3rd round allotment. Should I go for spot round for better nits like allahabad, trichy etc or should I lock this choice??? plz give me an answer….. I am Manoj Prudhvi I got Gate 2016 Score of 402; AIR 12484; Category :OC in ECE .I want to apply for National Spot Registration which iits and nits will I got.The amount 40000 will be refunded if seat not alloted. can i get any NIT? Sir I hv got NIT Manipur in second round of ccmt and I dnt want to join it .I m expecting for manit bhopal my first preference …what can I do now ?? gate score 378 obc cse branch possible nits? Hello sit my gate score is 486 in electrical engineering and i belongs to general category ..and i wants power system engineering ..so what are my possiblities and which nit colleges i can get during counselling or NFR. which nit can i get? can u suggest me my expected options? CAN US SUGGEST ME MY OPTIONS..
Sir I got 463 gate score ec branch from open category.which colleges I can get in ccmt?? sir MA gate score is 363 in EE branch and am SC candidate which nit I get. Sir MA gate score is 363 in EE and am SC category which better nit may I get. I secured 596 gate score and rank is 1780. Could you please tell me the NIT’s i can apply to my rank range and the best option that would be? sir, i have passed in gate in engineering science paper, but i want to have a sit in material science in M.Tech. but material science is not shown as available choice in my applying profile in ccmt. can you help me about this? Sir, I want to know how we should set preference by college wise or by branch wise. Eg. 1 is best branch then 2 and 3.
can I get mnit jaipur with power system branch????? My GATE score is 493 and I have secured AIR 454 in GATE Biotech 2016. Will it be possible for me to get admission into NITs, like NIT Allahabad, NIT Bhopsl, NIT Kurukshetra..? Sir my rank is 900 and my gate score is 500 and no is 43.33 in instrumentation branch which nit I can get ?which branch is preferable sir? Sir my category is obc ..
Hello sir, my GATE score 351 , branch ME , SC category. Pls tell me which NIT and branch i can get ? My gate sore is 487 in the year 2016, rank 6239. Which NITs can I get admission in ? Also, some institutes such as NIT, Jalandhar and PEC, etc are not available to me in the choices. My B.tech final semester result is to be declared by June/July 2016. My CGPA is above 8.0. Why are all choice not available to me? general category .5465 AIR rank. EC branch. in wat nits ..i can get admission for communication systems ,vlsi, microelectronics and vlsi. sir, my score 432, EE , OC category, wHat are my chanchs in NIT ? Sir, my 2016 gate score is 467 in ECE, and I am OC, can I get seat in nits through ccmt. Hello sir,national sport round me jo money RS.40000 lagta h o money last ko student ke ,academic fee me chala jata h ,ya sport round counselling ke charge ke rup me government ko chala jata h ,please inform me sir. my 2016 gate score is 539 with 39.73 marks from EC . for VLSI , EMBEDDED , DIGITAL SYSTEMS , which nits i should apply ? and if i got selected in 1st round can i participate for 2nd round ? My GATE score : 668, Branch: ECE, Marks: 49.79, Rank: 1209, Year: 2016, Category: General. Which NIT & specialization should I apply? My Gate score is 416 under open category and rank is 11142.Is there any chance for me??? best nit for VLSI & MICROELECTRONICS according to my rank??? plzz suggest me the top 10 choices that I should fill. Sir, I belong to general category branch ece. My score is 558 rank 3390. Please suggest which if I have chances of getting admission in nits. gate 2016, cs/it, score- 367, cat- gen, rank- 10938…………..should I apply for ME/MTech in Hyderabad University/ Tezpur University/ Jadavpur University/Osmania University/JNTU or can I get anything better through ccmt ? Sir my gate score is 677, marks 61.74 rank 2876 mechanical branch OBC. Which NIT should I apply to get thermal in 1st or 2nd round? my gate scor-550 electrical gen which nit will i get?? ?